Welcome Friends [D6579] - $13.44 : Yarn Tree, Your wholesale source for cross stitch supplies. Cross stitch pattern from Cuore E Batticuore. 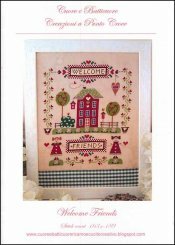 What a cute design to stitch & hang by your front door, welcoming your friends! This design features a house in the middle with blooming flowers & birds singing in the tree-tops. A flower heart border is stitched around the home with a "Welcome," sign stitched in the middle. Two girls holding onto a sign that says, "Friends," is stitched below. Stitch count 163 x 189. Stitched on #8681 Belfast Linen Antique Ivory 32ct. This was an exclusive design for the 2018 Nashville Needlework Market.